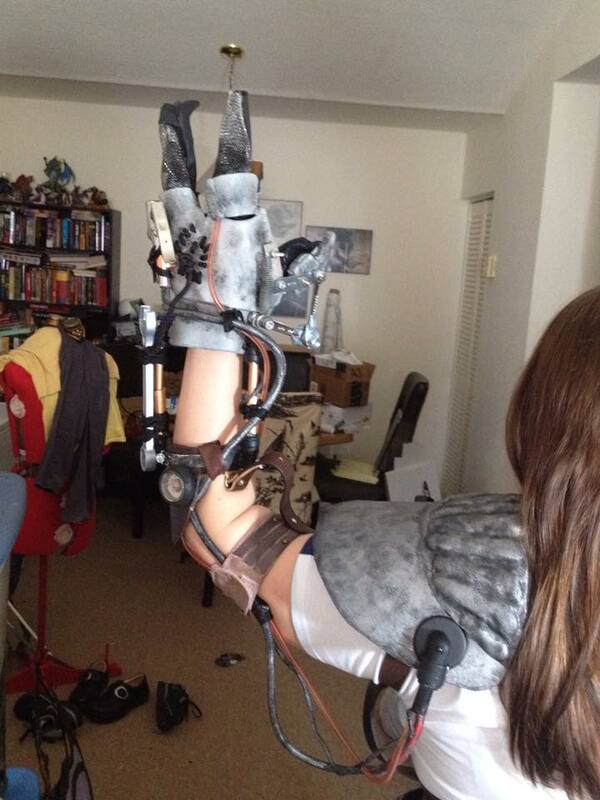 Your arm is mostly done. Now, it's time for the straps! I went to a few local thrift stores and just found old, abused, ratty looking belts. I ended up getting most of mine from a clearance center thrift store. Approximately 20 belts for $5. Not bad. I've never worked with leather, so I figured belts would be easier to work with than making my own straps. Make sure you get a wide variety of colors (browns, blacks, reds), and sizes. First, decide which belts you are going to use for the main support across your torso (3 belts). If you are wearing an actual corset with your outfit, I recommend you wearing it while making your straps so you are the correct size. Put on the three belts. Using a thinner belt, clamp in place the strap the goes across the front and back. Next, make the arm strap. I used a single belt, thread it through itself, and connected it to the main strap and the cross strap. I used clamps to hold them in place, then drilled a hole, then riveted. Attach small leather strap to D ring (mine came off while doing this. Simply reattach). Put on arm. Measure out from elbow to shoulder and clamp small strap. Rivet. Now, let's make the pauldron and shoulder pad (ignore that it's in the pics above. I did things very crazily). 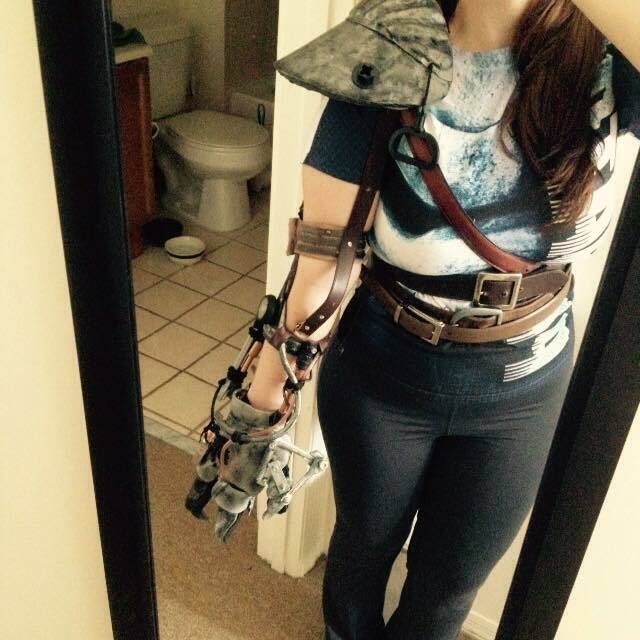 Use newspaper and draft out your pauldron. Test. If you like it, cut from EVA foam. Now along the medial edge is supposed to be cut outs that are raised. I decided to not do that. Instead, I achieved a similar look by sculpting ridges with instamorph, then covering the area in worbla. Heat and bend. Tape in place. Set aside. Once cool, paint black, then paint in a similar fashion to your hand base. Weather heavily. I used a toy screw in the front for the lump she has (circle above). I also found an old pull handle that I threaded through a hole I drilled. In the back, all of those tubes need to plug in. 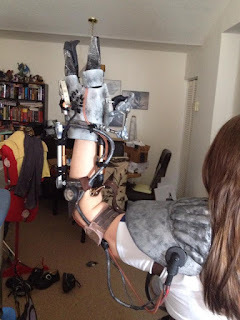 In order to keep the pauldron separate from the rest of the arm, I decided to make a disconnect. I used the same elbow piece that I used for my hydraulic rams, just in a larger size (1/2" OD). I then got a small piece of 1/2" OD tube. Paint everything black. With help, feed the tubes/cords through. The bungee will stretch, allowing the other two to shove in. I also used a plastic giant screw looking piece I found in the kitchen sink section. Not sure what it's called. I cut off a huge portion and drilled a hole in it. Then, I attached the elbow piece just like I did the hydraulic rams, using a bicycle spoke. For the pad, I drew out pattern and tested it under the pauldron. Mine is actually a bit too small, but it works if I pull it forward. I had some scrap white fabric that I had on hand. Also, measure your bicep area and cut out a thick strap from the same fabric. Cut out. With right sides together sew, leaving an opening. Turn right side out. For the strap: fold end in and sew. Mark and sew where you want your velcro to go. 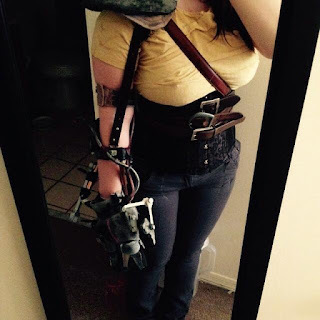 Add leather straps (I hot glued them on). Now since I used white fabric, these are horribly off from hers. I used fabric paint, watered it down, then painted the fabric, both sides. Also be sure to dirty it up, using blacks and browns. 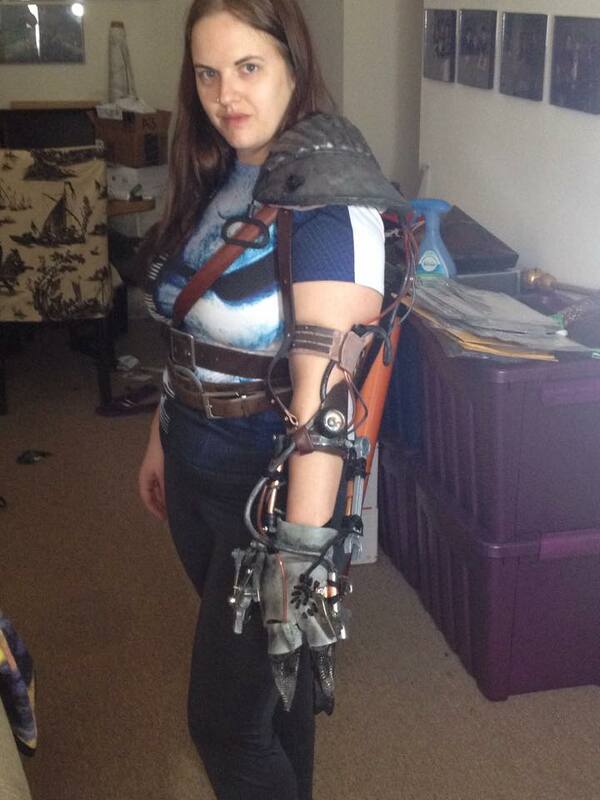 Next, you need to attach this to the straps so your pauldron stays on. Put on your arm. With help, figure out where to attach straps so your leather straps will be attached to your pad. I used velcro so it can be taken off. Use velcro to attach pad to pauldron. If your pad won't stay velcro'ed to you leather straps, you may need to attach it permanently to your harness. And finally, you may need a clasp for your wrist. This is at the end because I had a hard time finding one. I ended up finding one in my supply bin. Josh had got it for his mando and said I could use one. Until next time, keep cosplaying! Any questions, comments, or requests, leave them below! Hi, thank you so much for posting these tutorials, they're helping me a lot with figuring out my own furiosa cosplay! 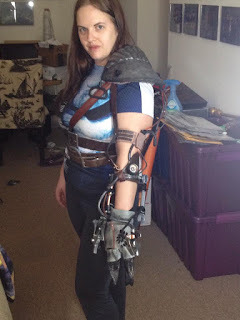 I don't have access to a drill in time for my event; do you think heavy-duty snaps would work to attach the straps to the 3 belts and the pauldron? If not, what would you recommend? Good luck with your build, and I hope to see pictures! Thank you for the help! I'm gonna try rivets in the future, but good to know that even that has its challenges :x But again thank you so much!